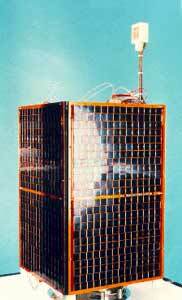 UoSAT-3 and UoSAT-4 (University of Surrey Satellite) were launched from Kourou on the Ariane flight V35 ASAP on the 21st January 1990. The satellites were placed into a 780 km, 98 degree sun-synchronous orbit. The primary payload carried by UoSAT-3 is a digital Store and Forward communications transponder supporting multiple access from hundreds of portable ground stations. It is particularly suited to communications in remote or disaster-stricken areas. Two experimental payloads are included to monitor the radiation environment experienced by the satellite in Low Earth Orbit (LEO), measuring cosmic particles, and total radiation dose. The satellite employs highly efficient Gallium Arsenide solar cell arrays in collaboration with Mitsubishi (MELCO-Japan), and inexpensive Nickel-Cadmium rechargeable cells in collaboration with AMSAT-NA in Canada. The payloads are sponsored by the Royal Aerospace Establishment (UK), VITA (USA-DoE), AMSAT-UK, and the University of Surrey through Surrey Satellite Technology Ltd. The three payloads carried by UoSAT-4 were technology demonstration payloads, evaluation the performance of new technologies in the space environment. A Transputer Data Processing Experiment funded by the European Space Agency (ESA) supports a CCD Earth Imaging camera to provide an in-orbit image processing test bed. A set of Gallium Arsenide panels produced by FIAR/CISE (Italy) and EEV (UK) were used. Payloads were sponsored by ESA, the Royal Aerospace Establishment (UK), and the University of Surrey through Surrey Satellite Technology Ltd.
UoSAT-4 carried the scientific payload complement to UoSAT-3, but failed due to an electrical fault after two days in orbit. The experiments were later reflown on UoSAT-5. UoSat 3 was later transferred to Satelife as Healthsat 1 for medical data transmissions.